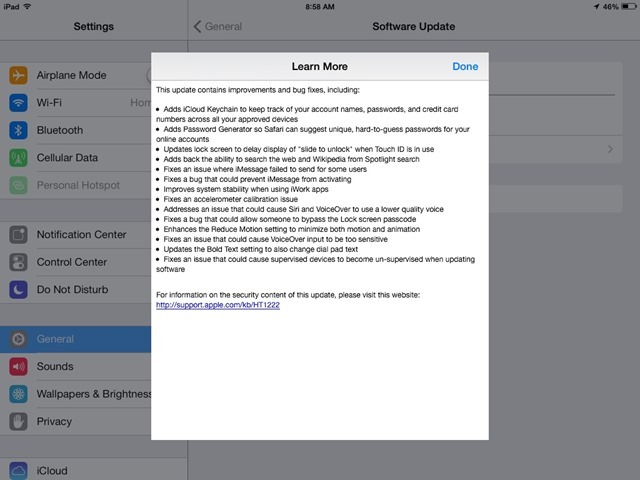 Last night Apple capped off a very busy day and released iOS 7.0.3 for iPad and other iOS devices. This latest iOS update brings the new iCloud Keychain feature and better password management in Safari, along with numerous bug fixes – including some related to issues with iMessage and Siri. A subset of users asked Apple to reduce the motion of the OS as it was causing motion sickness for them; a setting that the company had included in the Settings app wasn’t enough, as it disabled the parallax effect of iOS, but not the new animations. Apple has listened, and iOS 7.0.3 the Reduce Motion setting (available in General → Accessibility) now truly reduces animations: switching to apps and back to Home screen, unlocking the device, and moving between folders is now a cross-fade that is much faster than Apple’s animations with Reduce Motion turned off. There are also bug fixes for some some well-known security issues and patching of vulnerable areas.